Tables in the cafeteria at the Mission Education Center (MEC) are carefully laid with pine cone turkey decorations, bright-colored tablecloths and big pieces of pumpkin pie. Students at this San Francisco public school are “newcomer” children, recently arrived to the United States from various Latin American countries. The Thanksgiving meal — actually during lunch on the Friday before Thanksgiving — is the first time many of them have tasted turkey, mashed potatoes, cranberry sauce or pumpkin pie. While the holiday is brand new to the children, the concept of gratitude is well understood. Teachers at MEC use Thanksgiving as an opportunity to ask their students to reflect on why they are grateful, and to share their life experiences with classmates. It is a moving experience for the teachers, many of whom have taught at MEC for more than 20 years. When I no longer had her near, I felt my heart was splitting and I’d cry so much that I couldn’t even breathe, just thinking that she had abandoned me and that I would never see her again…. Many MEC families have experienced being apart for lengthy periods of time. Parents left their children with relatives in their home countries while they immigrated to the U.S. After settling, they found ways to bring their children to join them. I want to give thanks with all my heart because I am finally living with my mom. When I was four years old, my mom came to the United States. Nobody told me anything and so when my aunt arrived at the house, I asked her where my mom was, my aunt answered me that my mom had to leave because she couldn’t find any work to support our family. I felt so very sad because my mom was my light, the one who took care of me and who gave me all of her love and affection. When I no longer had her near, I felt my heart was splitting and I’d cry so much that I couldn’t even breathe, just thinking that she had abandoned me and that I would never see her again….It has been a few months since I came here to live with my mom. At first I felt very confused but then little by little I got used to her. I give thanks for all the meals and food that my parents give me and for those which I receive at school. I consider myself very fortunate because I know that there are millions of people in the world who do not have anything and they starve to death. That’s why food is such a treasure to me and it hurts me to see when others waste it throwing it away in the garbage. Finally, I give thanks for having the opportunity to learn in this school and for advancing more — well, in the school where I used to be, I didn’t get to read every day nor did they teach me how to divide. Teachers at the Mission Education Center face many challenges when trying to prepare their students for other district elementary schools, where most instruction is in English. “It’s really, really hard not only for the academic background, because some of them have never been in school before, but also the emotional impact,” said fourth and fifth grade teacher Lilly Chow. She said her students often act out in class because they are frustrated or confused not only about school work, but also about being in a new country with families they haven’t seen in a long time. The school district recommends the Mission Education Center to families if language and placement exams show that the student has few English skills and little academic experience. Chow says some of her students are in fourth or fifth grade, but have only completed first grade in their home countries. 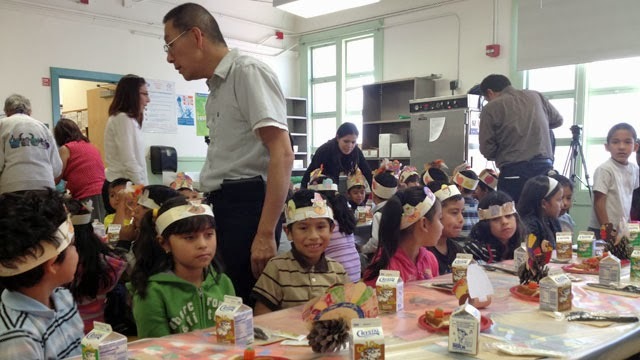 The school district operates a similar newcomer school for Chinese-speaking children in the Financial District called the Chinese Education Center. Listen to Katrina Schwartz’s story from November 22.